BBC NEWS | UK | Magazine | Why is a four octave vocal range so rare? Why is a four octave vocal range so rare? Yma Sumac, the Peruvian soprano famous for her range, has died. Her voice spanned more than four octaves, but why is that so unusual? 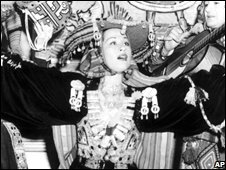 Many things were considered amazing about Yma Sumac, from her exotic costumes to her claims about being an Inca princess. But her extraordinary voice is what really made her special. Known as the Peruvian songbird, it ranged over more than four octaves. It made her a Hollywood star in the 1950s and she stunned audiences globally throughout her long career. To this day Sumac, who died at the weekend, is considered to have one of the biggest vocal ranges of any singer. Such a range is so unusual because the human voice is very limited and we use only a small part of it. This makes it very difficult to expand the vocal range and articulate such high notes. Exploiting the range we do have comes down to physical aspects, like body structure and the length of vocal cords, technique and psychological attitude. There has been a massive amount of research over the years to try and understand why our voices are so limited, says vocal coach Janet Edwards, who's worked with Leona Lewis and Spice Girl Mel C.
"What we do know is most people are capable of three octaves. The average person could sing within this range with very good guidance from an expert." Most classical singers who have been professionally trained are still within this three octave range. A modern day comparison to Yma Sumac is Mariah Carey. She has a multi-octave vocal range which can reportedly reach five octaves. "The young Mariah Carey used to sing in a lowish voice and then these stratospheric notes would sound more and more like whistling," says Gillyanne Kayes, vocal trainer and voice researcher. "It takes a high degree of skill to sing across a range. The colour, or timbre, of a voice is not the same all the way through." And octave range doesn't just come down to physical attributes and technique, it's about the psychological as well. "People can have a fear of using their voice," says Ms Edwards. "Teaching someone is not only about getting people to use their body properly and breath right, it is also about giving people the right attitude to free their voice. You have to look at the voice from all angles." But having a wide range does not equal a good singing voice per se, says Ms Kayes. "In the latter years of Billie Holliday's life it was a pretty limited range, which inevitably was due to her years of alcohol and drug use. But she had this enormous expressivity which she was able to convey in seven to 10 notes, which is actually the range of your average pop song. "Someone like Amy Winehouse, for example, mostly limits herself to about seven notes in a song. It's very difficult at the top of the range because you just can't articulate words up there. It's more what I would call a whistling sound."